This is the day that the Lord made! Let us be glad, and rejoice in it! Oh, I wish... I'm trying so hard to do that, lately, but nothing is flowing but ideas that stay jammed up in my mind until they grow stagnant and uninteresting. Maybe that's what it is, though. Maybe this is my "nothing" time. That is what is flowing like a river! Just, nothing! The real river... the Kilchis river, and the many coastal streams that surround me are low and clear and... nothing. It's early for the pinch period, but it seems like it is as dead! The rivers barely move as they head out to the ocean. And yes. That's me. I'm barely moving. Yesterday, I moved a couple of pieces of wood from where we plunk fish in the winter time. It kept grabbing our tackle, so I got in there with my bare legs (brrr!) and moved them. I just wish someone would do that to me! Pick me up, and give me a shove, so that I can float a little! Move a little! My energy seems at an all time low. I'm stuck in a hole like those logs, going nowhere any time soon! I don't feel like doing anything or going anywhere! And when I decide to not go somewhere, I stay home and feel badly about not going somewhere! Doing something! Guilt! Bill and I were discussing what effect my loss of vision has had on me. It's been what? A year? Maybe more. But, he says that I'm not as interested in the birds. I guess that's true. It is frustrating not to be able to spot them, the way I used to. I used to be fascinated by the colors on their feathers, but they aren't as easy to see, now. I used to be a slave to dusting the house. At the first sight of dust, it would drive me crazy. Now, I just don't see it! I'm free! I dust, now, by Braille. If I can feel it, I dust! I think that my stagnation is partially due to not being able to see as well. I've only lost 10 points of sight, actually, but I've had to yet again, change my lead eye. It's just that I have try to see things, that used to "flow like a river"... or be easy. It old my doctor that it was like there is a disconnect from my brain to my eyes, where I have to work to see. Things that I used to "see" without effort, now takes my concentration. Social situations aren't as easy as they used to be. I can't as well see who I am talking to. Now, that was hard, before, so now? I just want to stay home! It's so embarrassing not to know with whom you are talking without getting four inches from their face, and then having time to process! I have met so many people through ifish. People know me, because I'm kind of front and center, here, but maybe I have only met them once or twice. This is not to say that if Bill walked up in a crowd, that I wouldn't know it was him. It's just people that I don't know well. Anyhow, add to that, the fact that I have a dog with separation anxiety, which gives me a sort of excuse for not going out and doing things. It drives me crazy that he's like that, but at the same time, I hate to see Willie suffer like that. We have a house cam with our alarm system, and we can see the dogs, while we are out. Bill bet that Willie would just cuddle up and rest like Revvie, when we left. NOPE! He paces and whines, and whines and paces. I don't think he sat down, once! Bill is over 70, and seems to have more get up and go, than I do! His river is flowing! Sometimes I think our age difference is perfect, because I'm disabled, and he's older. We get tired, sometimes, but lately, I think he is the younger one! When he was younger, he was kind of hyper, and I think that tendency keeps him going, even after he's tired! My curiosity is usually what keeps me going, but lately, that's a bit missing. I've had spells like this, before. I know that this, too, shall pass. Many years ago, I lost my husband, my Grandmother, my 16 year old cat, (Catarabbit) and then my Mother... all in a period of two months. I fell into a period of depression. The doctor prescribed prozac or something like that, and I absolutely detested it. Instead, I bought this book on depression, that I so wish I could recall the title! It was so good! It actually celebrated depression as a normal phase of life! It taught me to enjoy it, and revel in it, and it worked! Before I knew it, I was off and running normally, again! Partially, because the book emphasized the need to coddle my soul... to do creative things that I enjoy. To paint, to write, to go on long bike rides, by myself. Things that I enjoy doing. I think the bike riding got my heart up and ticking and the art work and writing brought me home to feeling good, again. I don't think I'm really depressed, so to say. Just in a bit of a slump. I'm ticked off that my eyesight isn't as keen.. It really is effecting my life. Do you know how much it is affecting my life? I stayed home last night, when I could have attended the Bounty on the Bay Banquet, and I missed Jim Martin's speech! That is how much it affects me! There is nothing more special than hearing him speak on my favorite topics, and last night, I guess he got a standing ovation! Oh, dang! If anyone has a recording of his speech, last night, please... please let me hear it! He is magic to my soul! But yesterday, against my first wishes, I did go fishing! I climbed in Bill's truck with two wild and happy dogs, and we went fishing! It was going to be hot, and I knew it. I didn't think it would be that good, and I didn't think we'd be comfortable! But, we went, anyway! I'm SO glad we did! Why do I never learn, that when I make myself do something, I am always glad I did!?! On the water, a cooling wind blew, and it was actually pleasant fishing in 85 degree weather! The dogs were really well behaved in the boat, and we just had a great time! We made plans to make an effort to bring home some spring chinook, this week! We are going to fish hard, this week! And while we were out on the river, I did a few of my favorite things! I love to stare into the water, over the gunnel as we proceed from the shallows to deep, seemingly bottomless pools, and into the shallows, again. The extreme tide exchange yesterday was so strong, and as the current pushed upstream, it created a swirling, mixed up muddy- seaweed stew! But, that flow! That energy! It was catching! That's when the title quote came to me, but a bit different... and I believe it reset my mood! It just made me smile! "May what I do flow from me like a [coastal] river, no forcing and no holding back, the way it is [with the tide!]. May I never lose the tides of youth!-- or something like that! Molly Mae, the fishing cat shows up every morning for breakfast, until today. Where is she, you guys? 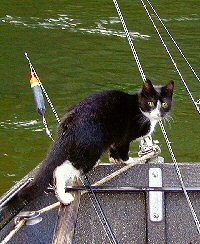 Who has borrowed my fishing cat? She never misses a meal. Molly is slender and wonderful, but call her late, but never call her late to dinner! Yesterday, Revvie went to the vet. We've been having troubles with her ears for about three years, so yesterday we had her in. She was put to sleep so that they could clean out her ears, and put in some kind of one time medicine that is to fix things, once and for all. I sure hope so, because in all of this time with trouble, I do believe her hearing has been affected. So, yesterday I spent worrying about Revvie, and today, Molly? Agh. Please say a prayer that she will come home, and I promise that if she does, I'll come straight here and report it. Until then, prayers, please! I love my Molly Mae! Still no Molly. I'm even more heart broken. When Revvie was at the vet the other day, the house seemed so vacant. Even though Revvie is so quiet, her absence that day was so loud! Now it's that way without Molly. Molly is a cat. Quiet, demure, sweet... and that sweetness is gone. I keep thinking of her head butts. She comes up to me in the sweetest way, and we bow our heads together. How I want that, right now. Ms, Mae! Come home to your Mama! I have searched high and low. I'm exhausted. I can't sleep. Bill said he doesn't want another cat, if Molly is gone, and if we should get one, he doesn't want to be close to it. Now, that's a rotten attitude, but I can relate. Loss is so hard! But, I'm not.. N O T going to be that way. I'm going to open myself up for heart break again! And again! And AGAIN! And frankly, I know that Bill will, also. He can't help but love animals. Both of us, be damned. We are fools for fur! I can't stand it when we close ourselves off to love, because love hurts so much. I refuse to be that way, no matter how my heart hurts, now. I'm not thinking that far ahead, yet, but I'm just saying... I'm a fool for fur, and I will furever fall. All is quiet on the Kilchis front. Very, very, eerily quiet. Everywhere I go, I expect to see Molly. In fact, it startles me at times. Shadows, etc., and even my mind playing with me. Last night I dreamt about her, and seeing her in my dreams shocked me so much that I woke with a start. I almost yelled to Bill, "Molly is home!" But, I caught myself in the dark of the night, knowing that I was all alone. There was no Molly sleeping softly on my legs. No Molly leaning over to head boop me. No Molly at ally. It was but a dream. I used to enjoy my time with Willie outside, singing to him as he raced around the field, but now, it's half songs, half searching in bushes, and calling out, "Here Kitty, Kitty, Keeeee." Willie is a bit disgruntled over that. Instead of me sitting calmly on my little travel stool, I find myself exhausted, constantly. I walk the road, searching. I make signs for Bill to hang on street poles. I spend time on "Lostkitty.com" on the internet, even all the while knowing that it is mostly fruitless. I mean, are the coyotes reading my signs? Do the bobcats have her imprisoned somewhere? I don't think cash rewards are what they were after. I check the game cam for clues, nearly every day. I used to leave it soak for weeks, so as not to spook the normal animal pattern of things. I'm so tired of calling "Kitty Kitty", but I can't help myself. I listen with the keenest hearing that I have, so to hear any slight noises she might make if she were hurt, somewhere. I flash my flashlight into the bushes, everywhere and anywhere. I have trudged through brush and blackberries, searching endlessly. I wish we had less brush! How do you give up? How do you finally say to yourself that she is gone, when you have no proof? Do I even want proof, if it is so? Could I handle that? Oh, Ms. Mae... Come home to your Mama. At the same time, I thank God for every lovely moment I ever had with you. I know it was a gift, and I know that what comes also goes. Maybe this is the first sign I am releasing her. As I watch the terrible tragedy that happened last night in Orlando, I have to realize that a missing kitty isn't much, in the scheme of things. But, still, my heart aches. My sympathy goes out to those who suffer so much more than I. Somehow, it doesn't take my pain down, though. The whole of it just increases. This too, shall pass and get more tolerable. But, Molly. Oh, my sweet Molly! Good morning! Good June... Good all that. It's been a week and one day. No Molly Mae. I'm beginning to give up, but I just can't. Everywhere I look, I see her, but it's in my mind. It was the worst, when I went for a canoe ride. I looked toward shore, as I was picking out my landing place, and I saw her, there. Meowing pleadingly to get in and go for a ride. She did that. She loved a canoe ride, but I know why. She wanted to get to the other side. It wasn't about the canoe ride, I don't think. But, she did enjoy it, I think. She'd look longingly down into the water, as if she was interested in what was down there. But, when we got close to the shore, I saw her main interest. She wanted to get out, over there! Molly was so adventurous! I couldn't let her out over there! I'd never find her! I had to protect her from lions and tigers and bears! Oh my! Oh, Molly. I can't write here. I can't function. I can't do anything but think about Ms. Mae. She was my side kick, just like Willie. Fishing. I try to think about fishing. I do! I heard that the summer chinook season on the Columbia is starting off with a bang. It's looking positive! A friend of mine hooked six and got one to the boat, but it was wild. Exciting fishing! Now, see? That's fishing! Even if you don't bring one home to eat! As for here, the hummingbird season is in full swing! They are just thick this year, which is so awesome! We haven't had a good hummy year in ages! I have to fill the feeder at least once a day. When they first got here, I had to fill it three times, the first day! The only problem with a good hummy season is that it takes quite a few of them little buggers to make a good meal. Hey! I'm joking! I might be getting over Molly Mae! I did a funny! I'm worried, though, that my "funnies" are getting darker and darker with each life loss! One thing that has been especially difficult, is writing! Or, so I thought... but once I sat down here and put my mind to it, it did flow quite easily. It's just that I'm sure you are tired of hearing about Molly. Have a great weekend, and a wonderful Father's Day! A couple days ago, I scratched my cornea, and I thought it was OK. Usually scratched corneas hurt like the devil, but this one didn't, so I thought I was OK. But, then I woke up the next morning, and couldn't see well! Everything was foggy! Talk about scary! I couldn't see to drive, or anything. It was like looking through fog at it's densest! And then.... and then it hit! The password change nightmare! Talk about frustrating, and I can't help anyone! So, I'm forwarding all of the "contact us" emails to Verticalscope and they are sorting it out. I do have to say... What a mess this is! Be patient, please! They are getting to every last e mail until they get everyone back on and comfortable, again! I'm good at passwords and that kind of thing, and even I had trouble! As you probably know, my voice is limited. But.... I am frustrated. Just know that. I have been at my keyboard way more than I am allowed. Way more than I should be. But, what am I to do? No time for writing about pretty clouds that paint the wisps of tree tops. Or, the feeling I get when I am alone on a summer day, walking through the woods. Nothing about sand between my toes, and mud splatters in my hair when Willie digs a hole on the beach. Nope. None of that. We are talking about tappity tap tap on the keyboard for hours at a time. My back aching, my eyes strained, and yearning for drops of moisture! Yeah! I can feel that, baby! I feel it! There is no stretching over the gunnel and gazing deep into the waters and being surprised to all heck when a Fall Chinook races under the boat 20 inches from my face! OH MY! That happened once! IT DID! I longgggggg for that! I long for the water splashing on the chines! I long for the salt air breeze and strong winds whipping my hair as we zoom along the shore line! YEAH THAT! Tappity tap tap tap.... at least I have time this morning to write about it. In a way, it is taking me there! But, no. Ding goes my e mail. "I CAN'T LOGIN!!!!" Scream the voices! I can relate to the frustration, but my soothing pseudo voice says, "I am so sorry for the delay in responding to your email.... " yaddeee yaddee ya. Let's get you fixed up!" "I have updated your e mail and resent your password form"
Use the contact form, if you are still having troubles, OK? I will help you! I cannot stand to see these long time members, or even new ones, not able to login to what I took years to build. The community is becoming fractured. Things like this have happened in my past. Wait. No they haven't. Not to this extent! If I owned ifish when this happened, I would fareak out! Yes. That word now has an "A" in it. FAaaaaREAK! At least, there is that. At least it's not my fault! Bill and I giggle at each other when something goes wrong, and we point at the guilty party between the two and say, "Fault!" If I could point that far, I would do it. "FAULT!" I just realized that I am typing fast, my real feelings coming out, easily and naturally for the first time in a very long time! Maybe this has been a good thing!? Maybe I have just missed writing. I haven't been able to, with all this password change stuff, for over a week, now! I'm caught up for now. Uh oh. Email bell just rang. It's so funny, because throughout the day, I keep saying that. "Caught up!" I go read another one, update the e mail, send out a password change form, answer the e mail and think I'm caught up. So, as soon as I answer these next ones, (It has dinged three times, while writing this...) I'm going to RUN this wobbly body away from the computer, as fast and as far as I can! I'm going to run from the ding! That is, until I pick up my ipad to play, and accidentally see that I have 32, no, 48 new e mails. I can't just not. I tried not. I have to. I must help ifish! I think it is my life. My love. My lampadephore! And if it weren't for my lethonomia, I could do this without so much latency! Look those up for more fun. I'm passed crazy. But, what's new?